Canvas is rolling out across the University by Semester 1 of 2016, which means we need to get a wriggle on! The central Canvas team and the Business School are providing a variety of support and training over this semester, to ensure that every course running next semester is successfully set up in our upgraded learning management system. There is pleasure and fear associated with a blank canvas. We’re free to do what we want, to start afresh and (one hopes) create a thing of beauty. Alternatively, we fear a blank canvas – what if our efforts fail and we just end up with a big mess and a lot of wasted paint and effort? 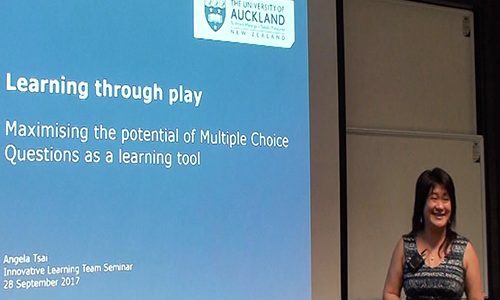 The fear and pleasure associated with newness is no doubt what many of us will experience in the coming months as we move over to Canvas, the new Learning Management System (LMS) which the University of Auckland has adopted. Would you like to enhance your students’ learning? Do you dream of enjoyable classes (for both you and your students)? Are you aiming for a 100% rating in item LS08 in your teaching evaluations? If you have answered “Yes” at least once, then Bodo Lang’s seminar on Classroom Engagement will definitely be of interest! Think back to your university days – can you remember how difficult it was to get the hang of all the obscure jargon your professors used? Now imagine that there were three or four times as many unfamiliar words and that you took much longer than other people to read texts and follow instructions. Are your class sizes increasing? Is your marking support limited? Are you finding it increasingly difficult to mark assessments?